Marxism is a philosophy, a world-view, a system of social and economic analysis, and, it became political doctrine. In understanding Marxism it is also important to understand the time in which Marxist ideology developed, which was during the culmination of The Enlightenment, the middle and late 1800s, when America still had slaves, women did not have the right to vote anywhere, women had very few rights at all in most places, the poor were extremely bad off in Europe, imperialism and colonialism were the order of the day, the world truly was dominated by a handful of extremely wealthy men, and science was being more widely embraced by average citizens throughout Western Civilization than ever before. Marxism is based on philosophical materialism. Philosophical materialism is the view that all things in the universe are natural and follow the laws of nature, i.e. that there is no such thing as the supernatural. Marx, and his associate Engels, developed a philosophy known as dialectical materialism. Dialectical Materialism is the merger of the ideas of dialectics and materialism and basically states that all things in the universe are material, that evolution is constantly taking place at all levels of existence and in all systems, that defined boundaries are man made concepts which do not actually exist in nature, and that the universe is an interconnected unified entity in which all elements are connected to, and dependant upon, each other. The philosophy holds that science is the only means by which truth can be determined. Metaphysical materialism states that the mind, or thought, is purely the product of the material composition of the brain. In other words, the physical and chemical makeup of the brain governs thought, nothing else. Marx also developed the philosophy of historical materialism, which is essentially the application of dialectical materialism to the study of history and sociology. Historical materialism was seen as a scientific approach to understanding history and applying that understanding to present situations. Based on Marx's study of society, Marx concluded that the economy formed the foundation upon which all other elements of society are based. Karl Marx's economic works are based heavily on the Classical economics of his day. Marx was heavily influenced by Adam Smith and David Ricardo, the two founders of Classical Economics. Das Kapital is both a criticism and an explanation of capitalist economy. It is a purely economic work that lays out the development of the capitalist economic system and the economic principles that govern it. Marx describes the defining feature of capitalism as the development of wage-labor. Prior to the development of capitalism, workers sold the products of their labor, but Marx pointed out that with the development of capitalism, workers no longer sold the products of their labor, instead they sold their labor itself. Thus, Marx said that under the capitalist system labor itself had become a commodity, known as labor-power. Marx's Theory of Surplus-Value and the Labor Theory of Value are cornerstones of his economic work. The Labor Theory of Value was first officially defined by the classical economist David Ricardo. Marx extended Ricardo's Labor Theory of Value. Ricardo's Labor Theory of Value stated that price of commodities were determined by the hours of labor spent on their production. This theory of value was shown to still have problems in providing an explanation for the prices of commodities however. Marx extended the the Labor Theory of Value to state that value is the product of "all socially expended labor" needed to produce a commodity, implying that labor other than the direct labor used by the individual to create the commodity was also factored into value. The Theory of Surplus-Value states that profits are a surplus value that is created by labor, but which is not paid to the laborer. By definition, a wage laborer never receives any of the surplus-value. Profits are the value that the laborer has created, but which goes to the capitalist. Marx held that the labor-value of a commodity is a point around which market values revolve, thus he described two different types of value, use-value and exchange-value. Use-value is the value of an object for satisfying some want or need, for example the value of a car is that it can transport people from place to place. This value is the product of labor and/or nature. Marx based this definition of value on John Locke's and Adam Smith's definitions of value, both of whom stated that labor is the primary means by which value is created. Locke argued that value that is inherent in nature is common property since it is not created by man. All other use-value that is not inherent in nature is the product of labor, and is rightfully the property of the person who labored to create it. Exchange-value is the value that a commodity has in a market, which is a socially created value. Exchange-value is the value that commodities are judged to have in relationship to other commodities. One basket is worth two eggs; three cows are worth a horse and wagon; a pair of shoes is worth $30, etc. In any economic exchange use-value is resolved to exchange-value by the parties involved in the exchange. Marx defined social classes objectively by the relationship of individuals to the means of production. In other words, Marxism does not see class as "rich and poor" and Marxism does not depend on how people view themselves in relationship to class structure; Marxism objectively classifies individuals based on the relationship they have to products of their labor. The two major classes defined by Marx are the bourgeois (a French term pronounced boor-zhwa') and the proletariat. The bourgeois are those who own the means of production and employ wage-laborers to get a profit. The proletariat are workers who must sell their labor-power to earn a living. Marx also described what he called the petty-bourgeois as basically small businessmen, managers, doctors, lawyers, the self-employed and craftsmen. Basically these are people who either do not earn a wage, but instead directly sell the products of their labor, or they are wage-laborers who do exercise control over the means of production as a part of their occupation. A principle development of Marxism is the theory of class-struggle. The theory of class-struggle is that societies and civilizations evolve through a process of struggle between the conflicts of interests among classes, and that dominant institutions in a society are a means of support for the dominant class in that society; that conflict within a society, and conflict between societies, are a product of class struggle. The theory of class-struggle is not a claim that classes should struggle, it is a claim that classes do struggle between each other. It is an observation, not a doctrine. What Marxists termed the "discovery" of class-struggle led to the concept that in order to abolish the struggle it would be necessary to abolish class distinction itself. 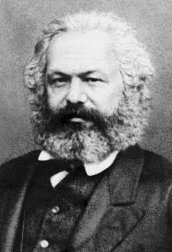 A huge misconception about Marx is the view that Marx was “anti-capitalist”. This is not exactly true. Marx believed that it was important for all countries to become capitalist and that after the world had developed a full free-market capitalist economy there would be a natural shift to communism. He recognized the importance of capitalism in developing a world economy. This is where many of the countries that adopted "Communism" during the 20th century differed greatly from Marxist theory. According to Marx's ideology capitalism is what creates the tools that society needs to develop a communist system, and at the same time capitalism creates its own problems that make it impossible to continue on in a capitalist system forever. Essentially he described capitalism as a transient phase of economic development. Marx promoted free-trade and vehemently opposed tariffs because he recognized that tariffs are tools used by capitalists to protect their own interests, whereas free-trade breaks down traditional cultural values, national boundaries, cultural barriers, and equalizes labor markets. Problems for the long term growth of capitalism were first discussed by Adam Smith and David Ricardo. Ricardo concluded that profits would eventually be squeezed out by rents and wages. He stated that a "stationary state" would be reached where capitalists would be making near-zero profits and no further capital accumulation would occur. Marx, described a much different conflict within capitalism than Ricardo, and refuted Ricardo's explanation for why there would be an eventual crisis in capitalism. Since Marx recognized that under capitalism wages were determined by labor markets, Marx concluded that wages would at first increase and reduce profits, but that capitalists would then eventually use laborsaving technology to to put human workers in competition with machines, thereby driving back down the price of labor. As this occurred, because wage-laborers do not own part of the means of production, a point would eventually be reached when society's capacity to produce goods and services would surpass society's ability to consume goods and services. In other words, we would be capable of producing more goods than people would be allowed to consume because it would be impossible for everyone to earn enough money to buy all of the goods that would be capable of being produced. In this scenario a disenfranchised class of non-property owners would be relegated to a miserable existence, while at the same time their needs would be perfectly capable of being met, and the potential of the economy would become limited by the legal ability of people to consume. In addition, Marx projected that capitalism would lead to increasing centralization of productive capacity as larger and larger corporations would continually drive smaller businesses out of the markets, resulting a market dictatorship by a small handful of owners, at which point the capitalist system itself would be destroyed since the system is dependent upon competition, which would ultimately be eliminated by the process itself. Marx published many articles in America, many of them in the New York Daily Tribune. Marx and Engels opposed slavery and wrote extensively on the matter of slavery in America prior to and during the American Civil War. They greatly supported the movement to free the slaves, yet they were also troubled by the labor conditions of the Northern industrial area. Marx worked as head of the International Association, a pro-labor organization that helped to improve the working conditions of working men and women around the world through the use of unions and strikes. Dialectic, the logic of philosophy, is the explication of the Concept in all essential shapes of life, in nature, soul, mind, and spirit. The movement of these living contents and the movement of dialectical thought is one and the same. The dialectical method was first understood by the Greeks and was seen as the process by which the mind orients itself to reality. Hegel's concept of the dialectic led him to assert that mind and reality are reflections of the same thing. Hegel concluded that the mind is a part of reality, that the mind is not separate from reality, i.e. mind is not supernatural, the mind is a part of nature. Hegel stated: "To comprehend what is, this is the task of philosophy, because what is, is reason." Despite this, Hegel's views still remained idealistic in nature and Marx later, along with other Young Hegelians, extended Hegel's concept of the mind and nature being one-and-the-same into the modern materialist framework, thus creating dialectical materialism. Hegel's concept of the "process of the dialectic" developed into the concept of thesis-antithesis-synthesis. Thesis-antithesis-synthesis is described as a continual process of conflict between the subject and its opposite, resulting in a "unification" which then becomes the subject of a new conflict. Ultimately this translates to the idea that progress is a product of conflict. After Hegel's death his philosophy continued to be taught in Berlin and an ideological split occurred among the students of Hegel's teachings. From Hegel's teachings a Right, Center, and Left branch of the ideology of Hegel emerged, the Young Hegelians taking up the Left branch of Hegelian thought. The Young Hegelians began using Hegel's dialectical method to criticize Hegel's own work, and through the use of the university press and other small presses they criticized the theological undercurrents of Hegel's works, proving the flaws in his own logic and proving that Hegel's own philosophy, when fully extended, supports atheistic materialism. The Young Hegelians criticized religious institutions and due to this many of them were denied professorship at the university and the university press was eventually shut down. In works such as The Life of Jesus, published in 1835, Young Hegelians, in this case David Strauss, attacked the Gospels and pointed out logical fallacies within the works. The Young Hegelians concluded that Christian mythology was the attempt of people to express the concept of universality, but being that they were insufficiently developed consciously the universal was projected onto the idea of a universal god. As such, some Young Hegelians interpreted early Christian ideology as progressive, and a step in the right direction, but not a completed concept of reality. It is now, almost to the year, sixteen centuries since a dangerous party of overthrow was likewise active in the Roman empire. It undermined religion and all the foundations of the state; it flatly denied that Caesar’s will was the supreme law; it was without a fatherland, was international; it spread over the whole empire, from Gaul to Asia, and beyond the frontiers of the empire. It had long carried on seditious activities underground in secret; for a considerable time, however, it had felt itself strong enough to come out into the open. This party of overthrow, which was known by the name of Christians, was also strongly represented in the army; whole legions were Christian. When they were ordered to attend the sacrificial ceremonies of the pagan established church, in order to do the honours there, the subversive soldiers had the audacity to stick peculiar emblems — crosses — on their helmets in protest. Even the customary barrack bullying of their superior officers was fruitless. The Emperor Diocletian could no longer quietly look on while order, obedience and discipline in his army were being undermined. He stepped in with vigour, while there was still time. He promulgated an anti-Socialist — I beg your pardon, I meant to say anti-Christian-law. The meetings of the overthrowers were forbidden , their meeting halls were closed or even pulled down, the Christian emblems, crosses, etc., were, like the red handkerchiefs in Saxony, prohibited. Christians were declared ineligible for holding public office; they were not to be allowed to become even corporals. Since at that time there were no judges so well trained in “respect of persons” as Mr. von Köller’s anti-overthrow bill assumes, Christians were forbidden out of hand to seek justice before a court. Even this exceptional law was to no avail. The Christians tore it down from the walls with scorn; they are even supposed to have set fire to the Emperor’s palace in Nicomedia in his presence. Then the latter revenged himself by the great persecution of Christians in the year 303 A.D. It was the last of its kind. And it was so effective that seventeen years later the army consisted overwhelmingly of Christians, and the succeeding autocrat of the whole Roman empire, Constantine, called the Great by the priests, proclaimed Christianity the state religion. Bruno Bauer, another Young Hegelian, produced a number of studies on the Gospels and concluded that though Christian ideology was progressive for its time it had become solidified in dogma when it was adopted by the Roman State, and thus ceased to progress, but instead held man back intellectually. Therefore, the Young Hegelians concluded that all religious dogma must be rejected in favor of atheism and that human self-consciousness is to be seen as the highest known existing understanding of reality. The Young Hegelians eventually split among themselves into "Left" and "Right" factions, with Marx developing the dominate ideology of the Left faction of Young Hegelian ideas. The "Right" faction of the Young Hegelians developed down the road into Existentialism and Nihilism, influencing such men as Frederick Nietzsche. Marxism, though, developed what can only be described as a more positive philosophy. Unlike the Existentialists and Nihilists, who saw life as ultimately meaningless, Marx developed a vision for humanity and gave human existence purpose in a materialist world-view. This is one thing that made the philosophy of Marxism so attractive during the turn of the century when science was advancing and old mythology and religious views were falling out of favor. Marxism, while atheistic, was also the most positive of the atheistic world-views. "The Nutrition of a Commonwealth consisteth in the plenty and distribution of materials conducing to life: in concoction or preparation, and, when concocted, in the conveyance of it by convenient conduits to the public use. As for the plenty of matter, it is a thing limited by nature to those commodities which, from the two breasts of our common mother, land and sea, God usually either freely giveth or for labour selleth to mankind." "... for a man's labour also is a commodity exchangeable for benefit..."
"... it is labour indeed that puts the difference of value on everything; and let any one consider what the difference is between an acre of land planted with tobacco or sugar, sown with wheat or barley, and an acre of the same land lying in common without any husbandry upon it, and he will find that the improvement of labour makes the far greater part of the value. I think it will be but a very modest computation to say, that of the products of the earth useful to the life of man, nine-tenths are the effects of labour. Nay, if we will rightly estimate things as they come to our use, and cast up the several expenses about them- what in them is purely owing to Nature and what to labour- we shall find that in most of them ninety-nine hundredths are wholly to be put on the account of labour." "The value of any commodity, therefore, to the person who possesses it, and who means not to use or consume it himself, but to exchange it for other commodities, is equal to the quantity of labour which it enables him to purchase or command. Labour, therefore, is the real measure of the exchangeable value of all commodities." "The real price of everything, what everything really costs to the man who wants to acquire it, is the toil and trouble of acquiring it. What everything is really worth to the man who has acquired it, and who wants to dispose of it or exchange it for something else, is the toil and trouble which it can save to himself, and which it can impose upon other people." "The value of a commodity, or the quantity of any other commodity for which it will exchange, depends on the relative quantity of labour which is necessary for its production, and not as the greater or less compensation which is paid for that labour." Marxism is based squarely on the materialist philosophy, i.e. the idea that everything that exists is natural and all things follow the laws of nature. Based on the materialist view of reality Marx began to study history and developed the ideology of historical materialism, which is basically an embracing of the idea that everything that exits is natural and that all things happen based on a cause and effect relationship, so, therefore, the present is a product of past events. Based on this it is possible to study past events, put them in context, and better understand the present. Based on the idea of historical materialism the relationship of events, causes and effects, can be traced back through time. By doing this it can be proven why the world is the way it is today. This of course upset a great many people when Marx began demonstrating how dominant groups of people, even people who had never seen themselves as having "done wrong", had arrived in their positions in life based on exploitive or infamous conditions of the past, of which their current social positions were products. In exploring root causes of social conditions Marx arrived at the conclusion that the most basic and fundamental aspect of society is the economic aspect. Marx concluded that man's relationship to the production and acquisition of resources forms the fundamental foundation upon which all other aspects of society reside. Marx expressed this by saying that man's relationship to the "means of production" forms the foundation of society. Marx concluded that economics was the most important field of sociological study, because he surmised that all characteristics of a society are a result of the economic basis of that society. Therefore, Marx concluded that in order to change the characteristics of a society it was necessary to change the economic basis of that society, i.e. man's relationship to the means of production. Marx viewed religion also as a product of man's relationship to the means of production. Marx viewed religion as a product of man's unhappiness with life and as a product of man's lack of understanding of social and economic forces, and thus the Marxist position on religion has always been two fold: 1) that criticism of religion and the advance of science are important elements for combating religious views, and 2) that religion will never be fully eliminated until man has control over the economy and man is no longer alienated from productive forces. Man, who looked for a superhuman being in the fantastic reality of heaven and found nothing there but the reflection of himself, will no longer be disposed to find but the semblance of himself, only an inhuman being, where he seeks and must seek his true reality. The basis of irreligious criticism is: Man makes religion, religion does not make man. Religion is the self-consciousness and self-esteem of man who has either not yet found himself or has already lost himself again. But man is no abstract being encamped outside the world. Man is the world of man, the state, society. This state, this society, produce religion, an inverted world-consciousness, because they are an inverted world. Religion is the general theory of that world, its encyclopaedic compendium, its logic in a popular form, its spiritualistic point d'honneur, its enthusiasm, its moral sanction, its solemn complement, its universal source of consolation and justification. It is the fantastic realisation of the human essence because the human essence has no true reality. The struggle against religion is therefore indirectly a fight against the world of which religion is the spiritual aroma. Religious distress is at the same time the expression of real distress and also the protest against real distress. Religion is the sigh of the oppressed creature, the heart of a heartless world, just as it is the spirit of spiritless conditions. It is the opium of the people. To abolish religion as the illusory happiness of the people is to demand their real happiness. The demand to give up illusions about the existing state of affairs is the demand to give up a state of affairs which needs illusions. The criticism of religion is therefore in embryo the criticism of the vale of tears, the halo of which is religion. Criticism has torn up the imaginary flowers from the chain not so that man shall wear the unadorned, bleak chain but so that he will shake off the chain and pluck the living flower. The criticism of religion disillusions man to make him think and act and shape his reality like a man who has been disillusioned and has come to reason, so that he will revolve round himself and therefore round his true sun. Religion is only the illusory sun which revolves round man as long as he does not revolve round himself. Marx's theory of class struggle is based on the idea of the dialectic and his conclusions about history and economics. Marx's theory of class struggle states that all of human history is a history of class struggles, of the conflicts of interests between dominate and exploited classes of peoples, and that the resolution to a conflict results in the creation of a new dominate class, which then becomes part of a new conflict. Marx's theory is that human society evolves through the class struggle, his theory is ultimately a theory of social evolution, and was touted by Marxists to be the social and historical equivalent of Darwin's theory of biological evolution, which had developed at around the same time. In terms of Marx's economic work, his view of value was heavily influenced by John Locke, who stated that all things that are created by nature are common property, and thus equally owned by all. Locke also stated that it was labor that both created value beyond that which nature creates and it was labor that defined a man's right to ownership of value. From these positions, and those of Adam Smith's as well, Marx saw all economic exchanges as exchanges of "labor-power". Since all natural materials are equally the right of every man, then these things have no exchange-value in and of themselves, because no one can exchange something that everyone already has equal right to. This means that what is really being exchanged is labor-power, the labor (physical or mental) that goes into altering an object from its natural state. Marx viewed labor as a basis for social relations. Human relations are based on shared labor, and according to Marx capitalism alienates people from the product of their labor and from each other. This, according to Marx, leads to commodity fetishism and social decay. We have seen what significance, given socialism, the wealth of human needs acquires, and what significance, therefore, both a new mode of production and a new object of production obtain: a new manifestation of the forces of human nature and a new enrichment of human nature. Under private property their significance is reversed: every person speculates on creating a new need in another, so as to drive him to fresh sacrifice, to place him in a new dependence and to seduce him into a new mode of enjoyment and therefore economic ruin. Each tries to establish over the other an alien power, so as thereby to find satisfaction of his own selfish need. The increase in the quantity of objects is therefore accompanied by an extension of the realm of the alien powers to which man is subjected, and every new product represents a new potentiality of mutual swindling and mutual plundering. Man becomes ever poorer as man, his need for money becomes ever greater if he wants to master the hostile power. The power of his money declines in inverse proportion to the increase in the volume of production: that is, his neediness grows as the power of money increases. So, at its core, this is what Marxism is about. Based on these ideas Marx and Engels did many studies and developed a number of other theories, primarily about economics. Marx focused on economics because he saw economics as the root of all other social conditions. Ultimately Marxism is a world-view; it is a holistic concept of reality. One of the best summaries of Marxism that I have seen is the one below by V.I. Lenin. While some of Lenin's rhetoric may be ignored (your choice), his explanation of the concepts of Marxism is succinct and to the point. Throughout the civilized world the teachings of Marx evoke the utmost hostility and hatred of all bourgeois science (both official and liberal), which regards Marxism as a kind of "pernicious sect." And no other attitude is to be expected, for there can be no "impartial” social science in a society based on class struggle. In one way or another, all official and liberal science defends wage slavery, where Marxism has declared relentless war on wage slavery. To expect science to be impartial in a wage-slave society is as silly and naive as to expect impartiality from manufacturers on the question of whether workers' wages should be increased by decreasing the profits of capital. But this is not all. The history of philosophy and the history of social science show with perfect clarity that there is nothing resembling “sectarianism” in Marxism, in the sense of its being a hidebound, petrified doctrine, a doctrine which arose away from the highroad of development of world civilization. On the contrary, the genius of Marx consists precisely in the fact that he furnished answers to questions which had already engrossed the foremost minds of humanity. His teachings arose as a direct and immediate continuation of the teachings of the greatest representatives of philosophy, political economy and socialism. The Marxian doctrine is omnipotent because it is true. It is complete and harmonious, and provides men with an integral world conception which is irreconcilable with any form of superstition, reaction, or defense of bourgeois oppression. It is the legitimate successor of the best that was created by humanity in the nineteenth century in the shape of German philosophy, English political economy and French Socialism. On these three sources of Marxism, which are at the same time its component parts, we shall dwell briefly. The philosophy of Marxism is materialism. Throughout the modern history of Europe, and especially at the end of the eighteenth century in France, which was the scene of a decisive battle against every kind of medieval rubbish, against feudalism in institutions and ideas, materialism has proved to be the only philosophy that is consistent, true to all the teachings of natural science and hostile to superstition, bigotry, etc. The enemies of democracy therefore tried in every way to “refute,” undermine and defame materialism, and advocated various forms of philosophical idealism, which always, in one way or another, amounts to an advocacy or support of religion. Marx and Engels always defended philosophical materialism in the most determined manner and repeatedly explained the profound error of every deviation from this basis. Their views are most clearly and fully expounded in the works of Engels, Ludwig Feuerbach and Anti-Dühring, which like the Communist Manifesto, are handbooks for every class-conscious worker. But Marx did not stop at the materialism of the eighteenth century; he advanced philosophy. He enriched it with the acquisitions of German classical philosophy, especially of the Hegelian system, which in its turn led to the materialism of Feuerbach. The chief of these acquisitions is dialectics, i.e., the doctrine of developments in its fullest and deepest forms, free of one-sidedness - the doctrine of the relativity of human knowledge, which provides us with a reflection of eternally evolving matter. The latest discoveries of natural science - radium, electrons, the transmutation of elements - have confirmed remarkably Marx's dialectical materialism, despite the teachings of the bourgeois philosophers with their “new” reversions to old and rotten idealism. Just as man's knowledge reflects nature (i.e., developing matter), which exists independently of him, so man's social knowledge (i.e., the various views and doctrines - philosophical, religious, political, and so forth) reflects the economic system of society. Political institutions are a superstructure on the economic foundation. We see, for example, that the various political forms of the modern European states serve to fortify the rule of the bourgeoisie over the proletariat. Marx's philosophy is matured philosophical materialism, which has provided humanity, and especially the working class, with powerful instruments of knowledge. Classical political economy, before Marx, evolved in England, the most developed of the capitalist countries. Adam Smith and David Ricardo, by their investigations of the economic system, laid the foundations of the labor theory of value. Marx continued their work. He rigidly proved and consistently developed this theory. He showed that the value of every commodity is determined by the quantity of socially necessary labor time spent on its production. Where the bourgeois economists saw a relation of things (the exchange of one commodity for another), Marx revealed a relation of men. The exchange of commodities expresses the tie by which individual producers are bound through the market. Money signifies that this tie is becoming closer and closer, inseparably binding the entire economic life of the individual producers into one whole. Capital signifies a further development of this tie: man's labor power becomes a commodity. The wage-worker sells labor power to the owner of the land, factories and instruments of labor. The worker uses one part of the labor day to cover the expense of maintaining himself and his family (wages), while the other part of the day the worker toils without remuneration, creating surplus value for the capitalist, the source of profit, the source of the wealth of the capitalist class. The doctrine of surplus value is the cornerstone of Marx's economic theory. Capital, created by the labor of the worker, presses on the worker by ruining the small masters and creating an army of unemployed. In industry, the victory of large-scale production is at once apparent, but we observe the same phenomenon in agriculture as well: the superiority of large-scale capitalist agriculture increases, the application of machinery grows, peasant economy falls into the noose of money-capital, it declines and sinks into ruin, burdened by its backward technique. In agriculture, the decline of small-scale production assumes different forms, but the decline itself is an indisputable fact. By destroying small-scale production, capital leads to an increase in productivity of labor and to the creation of a monopoly position for the associations of big capitalists. Production itself becomes more and more social-hundreds of thousands and millions of workers become bound together in a systematic economic organism-but the product of the collective labor is appropriated by a handful of capitalists. The anarchy of production grows, as do crises, the furious chase after markets and the insecurity of existence of the mass of the population. While increasing the dependence of the workers on capital, the capitalist system creates the great power of united labor. Marx traced the development of capitalism from the first germs of commodity economy, from simple exchange, to its highest forms, to large-scale production. And the experience of all capitalist countries, old and new, is clearly demonstrating the truth of this Marxian doctrine to increasing numbers of workers every year. When feudalism was overthrown, and “free” capitalist society appeared on God's earth, it at once became apparent that this freedom meant a new system of oppression and exploitation of the toilers. Various socialist doctrines immediately began to rise as a reflection of and protest against this oppression. But early socialism was utopian socialism. It criticized capitalist society, it condemned and damned it, it dreamed of its destruction, it indulged in fancies of a better order and endeavored to convince the rich of the immorality of exploitation. However, utopian socialism could not point the real way out. It could not explain the essence of wage-slavery under capitalism, nor discover the laws of its development, nor point to the social force which is capable of becoming the creator of a new society. Meanwhile, the stormy revolutions which everywhere in Europe, and especially in France, accompanied the fall of feudalism, of serfdom, more and more clearly revealed the struggle of classes as the basis and the motive force of the whole development. Not a single victory of political freedom over the feudal class was won except against desperate resistance. Not a single capitalist country evolved on a more or less free and democratic basis except by a life and death struggle between the various classes of capitalist society. The genius of Marx consists in the fact that he was able before anybody else to draw from this and apply consistently the deduction that world history teaches. This deduction is the doctrine of the class struggle. People always were and always will be the stupid victims of deceit and self-deceit in politics until they learn to discover the interests of some class behind all moral, religious, political and social phrases, declarations and promises. The supporters of reforms and improvements will always be fooled by the defenders of the old order until they realize that every old institution, however barbarous and rotten it may appear to be, is maintained by the forces of some ruling classes. And there is only one way of smashing the resistance of these classes, and that is to find, in the very society which surrounds us, and to enlighten and organize for the struggle, the forces which can—and, owing to their social position, must—constitute a power capable of sweeping away the old and creating the new. Marx's philosophical materialism has alone shown the proletariat the way out of the spiritual slavery in which all oppressed classes have hitherto languished. Marx's economic theory has alone explained the true position of the proletariat in the general system of capitalism. Marx himself was involved in politics. 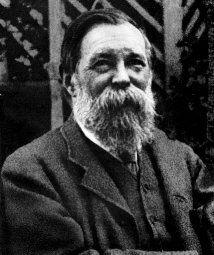 He and Frederik Engels authored the Communist Manifesto in 1847, though Marx is often said to have disagreed with many in his own time who began calling themselves Marxists. In the political sense "Marxism" embodies many different, and sometimes conflicting, political ideologies. In discussing "Marxism" one may either be discussing the political doctrines of Karl Marx and Frederik Engels themselves, or one may be describing the entire suite of other Marxist ideologies, all of which are based on Karl Marx's original views.